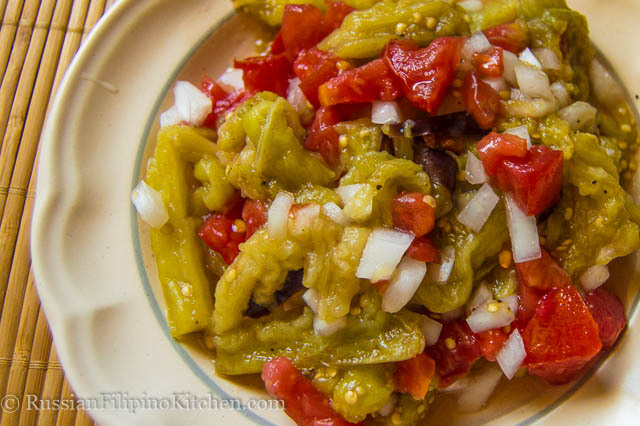 There are only few salad dishes in Philippine cuisine, and out of those, my favorite is this roasted eggplant salad or ensaladang talong in Tagalog. This salad has just the right balance of flavor and texture– not too sour, salty, or sweet. 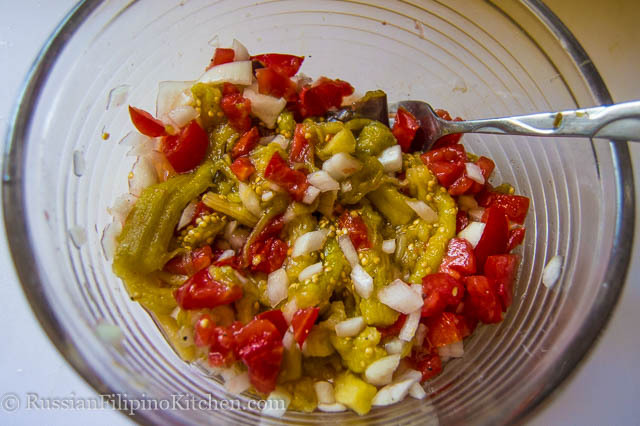 The richness of roasted eggplants with a hint of sweetness from the onions and tomatoes mixed together in a light dressing of vinegar, salt, and sugar makes for a simple but tasty side dish. 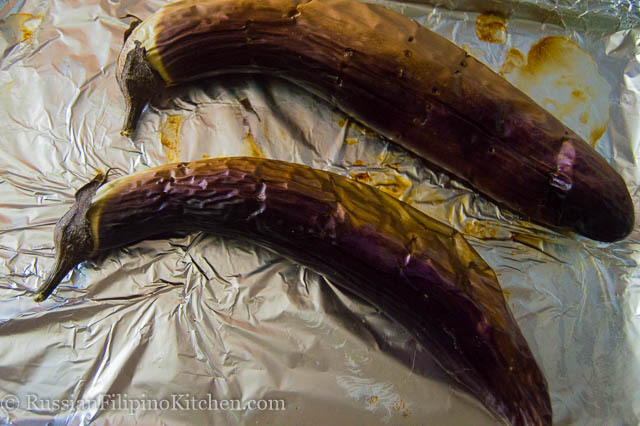 To make this, you’ll need Asian eggplants: Chinese, Japanese, or Filipino variety. They’re the ones that are long, skinny, and with dark or light purple skin. You can roast the eggplants three ways. First, is to roast it over hot charcoals till the skin looks burned and wrinkly. 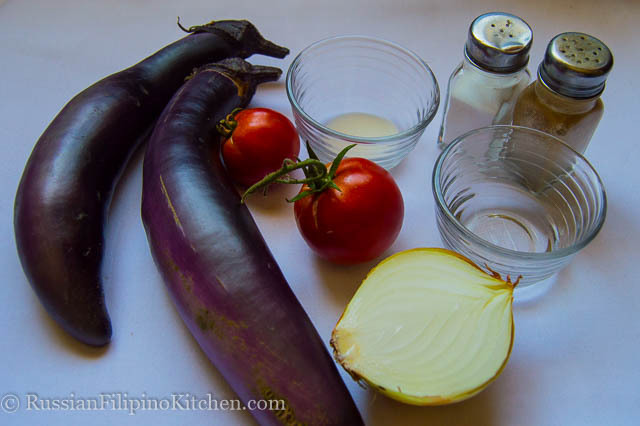 The second method is to put the eggplants directly over the flame on a stove. And the third way is to broil them in the oven. I prefer the last method over the others because of convenience (no need to go outside to start the grill), less mess, and not having to deal with burnt smell all over the kitchen afterwards. This recipe is very easy to make. The only challenging part is roasting the eggplants, but once you do this a couple of times, it’ll be a breeze. You can also prepare it ahead and chill it in the refrigerator until ready to serve. 1. Use a fork or knife to pierce eggplants on all sides, and then place on a baking sheet (I prefer to line my baking sheet with aluminum foil for easy cleanup). 2. 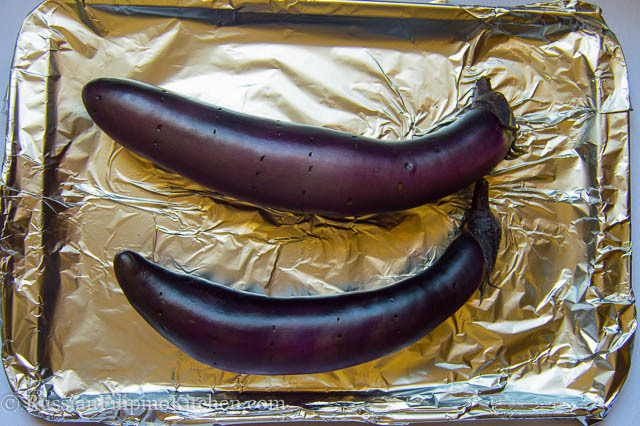 Set your oven to broil setting and roast eggplants uncovered for 20-25 minutes until skin has wrinkled and darkened. Remove from oven and set aside to cool. 3. 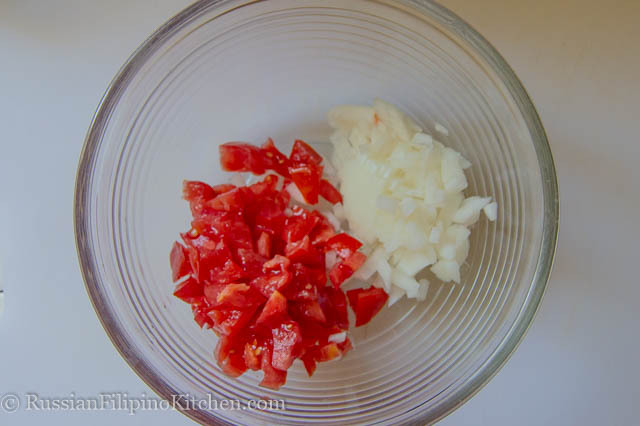 Meanwhile, dice tomatoes and chop onions and place in a bowl. 4. Once eggplants have cooled, peel them carefully, removing as much skin as possible. Don’t worry if you’re unable to remove all of it, they won’t affect the taste of the salad. 5. After you peeled the skin off, cut the stem off then cut eggplant into 3-inch lengths. 6. Place eggplants in the bowl together with tomatoes and onions. Add vinegar, sugar, and salt. Toss salad and serve. 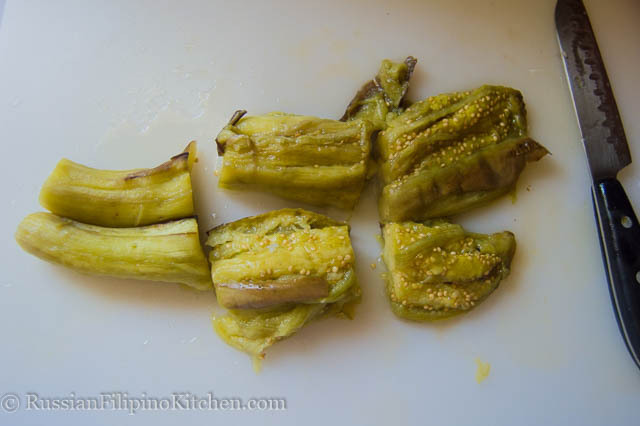 Use a fork or knife to pierce eggplants on all sides, and then place on a baking sheet (I prefer to line my baking sheet with aluminum foil for easy cleanup). 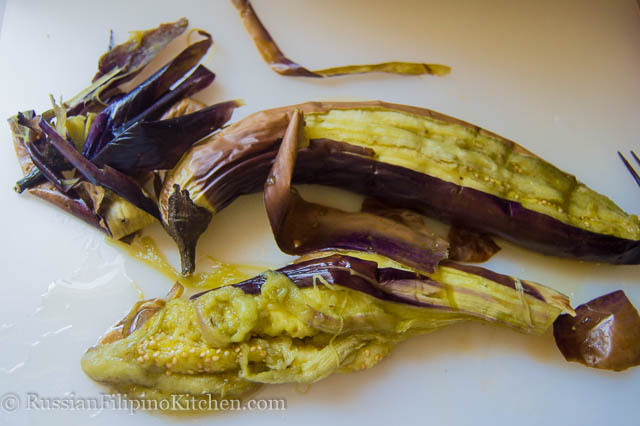 Set your oven to broil setting and roast eggplants uncovered for 20-25 minutes until skin has wrinkled and darkened. Remove from oven and set aside to cool. Meanwhile, dice tomatoes and chop onions and place in a bowl. Once eggplants have cooled, peel them carefully, removing as much skin as possible. Don’t worry if you’re unable to remove all of it, they won’t affect the taste of the salad. After you peeled the skin off, cut the stem off then cut eggplant into 3-inch lengths. Place eggplants in the bowl together with tomatoes and onions. Add vinegar, sugar, and salt. Toss salad and serve.